They are one of music’s most idolized groups that took the world by storm. They have sold more albums then almost any group in the history of the music industry. They are ABBA. Anni-Frid Lyngstad (born in Ballangen, Norway, on November 15, 1945), Agnetha Fältskog (born in Jönköping, Sweden, on April 5, 1950), Göran Bror Benny Andersson (born in Stockholm, Sweden, on December 16, 1946), and Björn Ulvaeus (born in Gothenburg, Sweden, on April 25, 1945) would all break away from highly successful solo projects and groups to form the group ABBA in 1972. The group was initially named Björn & Benny, Agnetha & Anni-Frid. In 1971 Ulvaeus and Faltskog would wed. Andersson and Lyngstad would pair up too not soon after. The couples began as a cabaret act. They entered Sweden’s Eurovision Song Contest and made into the preliminary rounds. They came in third, but “Ring Ring”, one of their songs, became a hit. It was featured on their debut album titled Ring Ring. In 1973 the group chose to go by just their initials, ABBA. This time around in the Eurovision Song Contest ABBA would make it to the finals with “Waterloo”. This poppy hit would steal first prize in the contest. The single became a worldwide hit and hit number 6 on the US Billboard charts. The song made it to number one throughout Europe. Their third album, ABBA, was released in 1975. It was a huge hit scoring hits with “Mama Mia” and “SOS”. The groups’ manager, Stig Anderson, helped ABBA by writing some of their hits. In 1976, ABBA released Arrival. Arrival would bring ABBA some of their biggest hits to date. In 1977, “Dancing Queen” topped the charts across the globe. This song in particular seemed to define who ABBA was as a group; it had captured their essence. By the late seventies disco music was the music of choice. This turned out to be good for ABBA however because much of their music was dance music anyways. People clamored to their hits making them one of the most successful groups of all time. The Album was released in 1977 and was also a huge success for the group. Following that success came Voulez-Vous the group’s sixth effort. After a long engagement Lyngstad and Andersson would marry in 1978. The following year Ulvaeus and Fältskog would announce to the world their divorce. Things were beginning to unravel for the group just as quick as they came together. 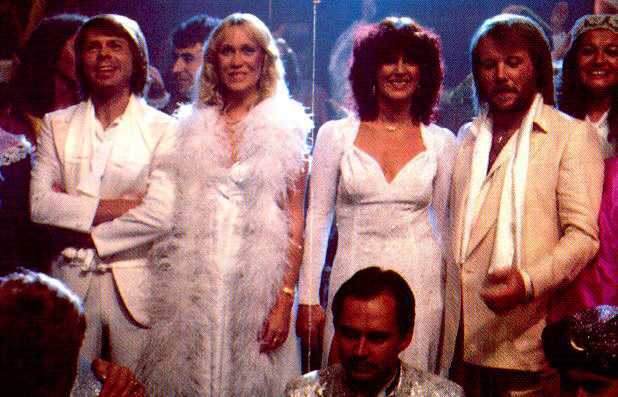 ABBA could no longer keep up the façade of two happy couples and suddenly their “poppy” image began to fade. This was even beginning to show in their works. The glow of the 1970s was fading away fast. In the 80s music scene, ABBA released The Visitors. This would become their final work. Lyngstad and Andersson would announce their divorce about the same time as the album was released. By 1982, all of the former members of ABBA were on to separate projects. Andersson and Ulvaeus would team up to work on the musical Chess though later on. In the 1990s, a new generation of fans was discovered and a greatest hits collection was released, which to date has sold over 26 million copies worldwide. In 2001, Mama Mia was released on Broadway and featured songs from ABBA’s heyday in the ‘70s. A movie derived from the play was made and released in 2008 starring Meryl Streep and other A list actors and actresses. It was a huge success, just like the group ABBA was.